Just a reminder for those in the SFL your matches are available and due by Sunday night. Good luck! Solo Fishing League Season 1 Registration is Open! 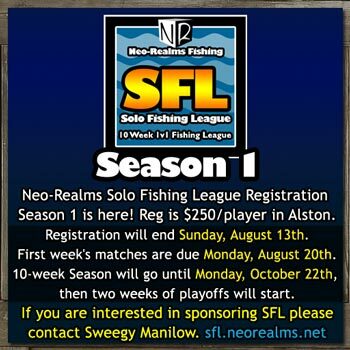 The first season of the Neo-Realms Solo Fishing League (SFL) is open for registration! It will have the same format as the TFL, with players competing against other players in their group in a 10 week match format. Registration ends August 13th. For more information or if you are interested in sponsoring, contact Sweegy Manilow. TFL participation badges have now been updated for your achievement hats. Thanks for playing Season 12! Federation Fishers TFL Season 12 Champs! 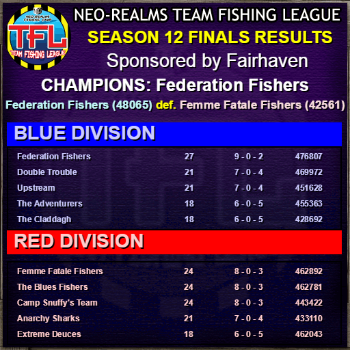 Congrats to the Season 12 champions, Federation Fishers! A big thanks to our season's sponsor, Fairhaven and the rest of our sponsors: Borg Capalini Designs, Camp Snuffy, and Hippy Air! The participation prize winner for this season goes to Reel Screamers! Prizes will be distributed this week. Be sure to stay tuned, we are working on a new 1v1 solo league format coming in the coming weeks! Thanks for participating in Season 12! The first round of playoffs are complete! 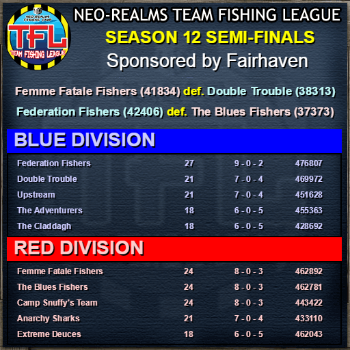 It looks like the finals will be a battle of the number 1 seeds, with Femme Fatale Fishers defeating Double Trouble, and Federation Fishers defeating The Blues Fishers.